England’s Grandmaster (GM) Gawain Jones claimed the Dubai Open Chess Tournament – Sheikh Rashid Bin Hamdan Cup after a masterful performance in Tuesday night’s final round at the Dubai Chess and Culture Club. Jones, who also won the Dubai Open Blitz Cup last Friday, outplayed Russia’s GM Boris Savchenko to finish the tournament undefeated with 7.5 points on six wins and three draws. Armenia’s GM Vladimir Akopian likewise played an inspired game in defeating Georgia’s GM Levan Pantsulaia to match Jones’ final tally, but the Englishman was awarded the championship after posting a superior tiebreak scorer. Akopian, who also finished the tournament undefeated, settled for the runner-up prize. 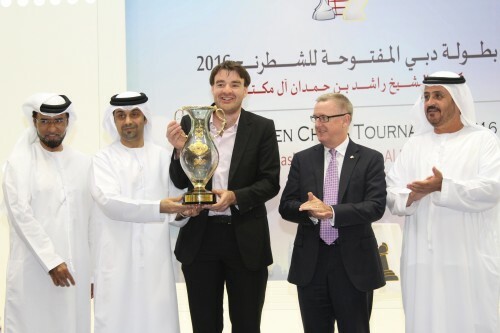 Jones received the Sheikh Rashid Bin Hamdan Cup and the US$ 13,000 top prize during Wednesday night’s awarding ceremony at the Dubai Chess and Culture Club. Jones employed the Moscow variation against Savchenko’s Sicilian Defence and maintained a slight edge out of the opening. It was the Russian’s passive play, however, that compounded black’s problems as Savchenko allowed Jones’ pesky bishop to invade the h6-square, preventing black from castling and leaving his king stuck in the centre. It went downhill for the Russian from thereon as Jones quickly organised an attack in the middle of the board, highlighted by a knight sacrifice on e5 that forced Savchenko to give up his queen on move 24. The Russian played for over a dozen moves more before resigning on move 37 after Jones wiped away all his queenside pawns. Playing the King’s Indian Defence (KID), Akopian was likewise quick to punish an errant play by the 2007 Dubai Open champion, GM Levan Pantsulaia of Georgia, to prevail in just 30 moves. Both players dished out 15 moves of standard play in a line of the KID’s Fianchetto variation when Pantsulaia suddenly deviated with a dubious attempt to win the exchange with 16.Bxe4 instead of the solid 16.Rxe4. Akopian responded forcefully to regain the exchange two moves later and ruin white’s queenside pawn structure in the process. The Armenian liquidated to a queen-and-bishop endgame with equal material, but white’s queen had to passively defend the f2-pawn, which was under attack by black’s more actively placed bishop and queen, giving Akopian a free hand to wipe out white’s unattended queenside pawns. Pantsulaia resigned on move 30. Brazilian GM Alexander Fier and Iranian GM Pouria Darini were the other players who had a chance to make it a three-way tie for first place, but the duo, who played another KID, ended their game in a draw by repetition on move 29. Savchenko salvaged third place, having the highest tiebreak points among six players with seven points apiece. Fier was fourth followed by India’s GM Vidit Santosh Gujrathi, Darini, Cuba’s GM Lazaro Batista Bruzon and Russia’s GM Mikhail Antipov. Gujrathi defeated Turkey’s GM Mustafa Yilmaz, Bruzon won over Spain’s GM David Anton Guijarro and Antipov beat England’s GM David Howell. Reigning national champion Fide Master (FM) Saeed Ishaq topped the UAE rankings with 4.5 points despite a setback against Indian International Master (IM) Das Sayantan in the final round. FM Mayed Alrashedi continued his solid performance with a draw with IM Rohan Ahuja of India in the final round to likewise score 4.5 points, although he was relegated to the runner-up spot after the tiebreaks were applied. Candidate Master (CM) Nagueb Saleh took home the top prize for the best Dubai player with four points and a performance rating of 2016, while Ali Abdulaziz was second also with four points and a performance rating of 1961. 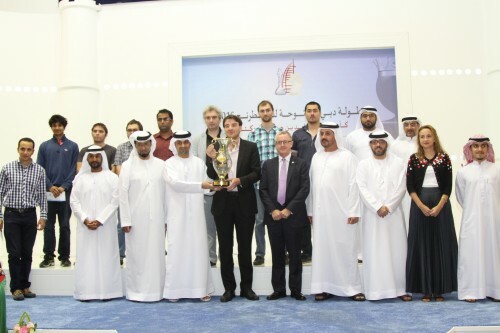 Egypt’s GM Bassem Amin took the prize for the best Arab player after finishing at 17th place with 6.5 points. 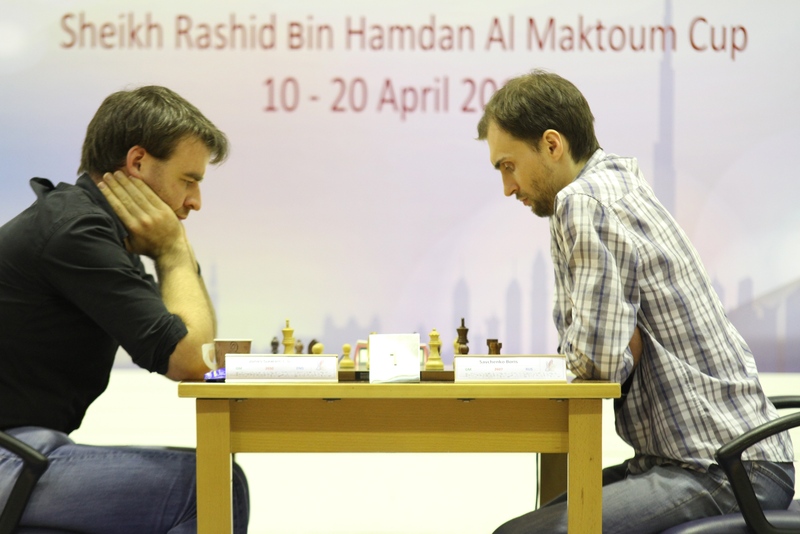 He defeated India’s GM Deepan Chakkravarthy J. in the final round. Former world women’s champion GM Antoaneta Stefanova of Bulgaria was the best female player with six points and rating performance of 2495. Ukraine’s IM Inna Gaponenko took the silver medal. The rating category winners were IM Nitin S. of India (above 2300), Al Muthaiah of India (above 2200), CM Peter Drost of the Netherlands (above 2100), Woman International Master (WIM) Ivana Maria Furtado of India (above 2000) and Nair Sanjeev of India (below 2000). The special prizes were based on a player’s tournament performance rating. Five youthful players also fulfilled international norms, led by 19-year-old IM Gagare Shardul of India, who gained a GM norm. Garnering an IM norm each were 15-year-old FM Aryan Gholami (Iran), 15-year-old Vugar Asadli (Azerbaijan), 19-year-old Daniel Anwuli, who is currently Nigeria’s best player, and 21-year-old Chinna Reddy C H Mehar (India).